Dar es Salaam: Publication of results relating to last Sunday's general election on Tuesday landed eight people, including three foreign nationals in court. 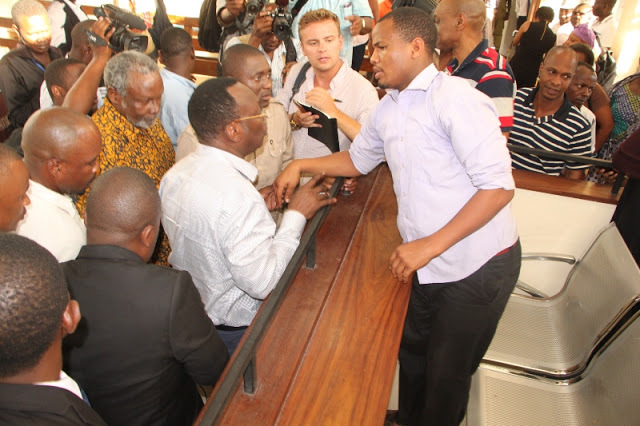 The accused persons are Mashinda Edwin Mtei (49), a resident of Arusha, Julius Mwita (30), a politician residing at Magomeni and Frederick Eddie Fussi (25), an Information Technology expert living at Mbezi. Others are Julius Mathei (45) a Kenyan, Meshack Mlawa (27), who is a pastor, Anita Rulanyaga (41) an Engineer, Jose Nimi (51), a citizen of Angola who resides in France and Kim Hyunwook (42), a Chinese. They were charged with publishing inaccurate information, while the foreigners face charges relating to engagement in employment and business without permit. Prosecution submit to court that between October 25 and 26, this year within the city of Dar es Salaam, the accused persons published false and unauthorised information online via a platform called “M4C Election Results Management System”. Prosecution further alleged that the false information was also published on other social media like facebook and twitter contrary to the laws of the land. The accused persons denied the charges before Principal Resident Magistrate, Respicious Mwijage. The magistrate adjourned the case to October 30 for determination of bail and ordered the accused persons to be remanded. Before adjournment of the case, a heated debate ensued between prosecution and defence as to whether the accused persons should be granted bail. Principal State Attorney Edwin Kakolaki, for the prosecution, informed the court that the Director of Public Prosecutions (DPP) filed a certificate under section 148 (4) of the Criminal Procedure Act, with a view to deny bail. He told court that the reasons for DPP's decision included the safety and interests of the republic which he felt would jeopardized if the accused persons are bailed out. Kokolaki however the court that the DPP was not required to disclose the nature of safety and public interests sought to be protected. But advocate Peter Kibatala, for the accused persons, strongly objected to the submissions by the prosecution and requested the court to disregard the DPP’s certificate and grant bail to the accused persons. Kibatala told the court that the certificate issued by the DPP takes effect only and only when it is filed in court. Kibatala also submitted that when considering the matter, the court should take into consideration of the seriousness or otherwise of the offences charged and analyze the safety and interests of republic sought to be protected. He submitted that section 16 of the Cyber Crime Act of 2015 does not establish the offence charged. “The charge suffers from wrong citation. The defective charge cannot be the basis for the DPP to issue the certificate,” he submitted.